I’ve been on a huge soup craze lately, and I’m not sure why….maybe because soups are low carb, maybe because it’s winter (although sometimes it feels more like spring in Dallas), or maybe its just because I’ve found some truly outstanding soup recipes. 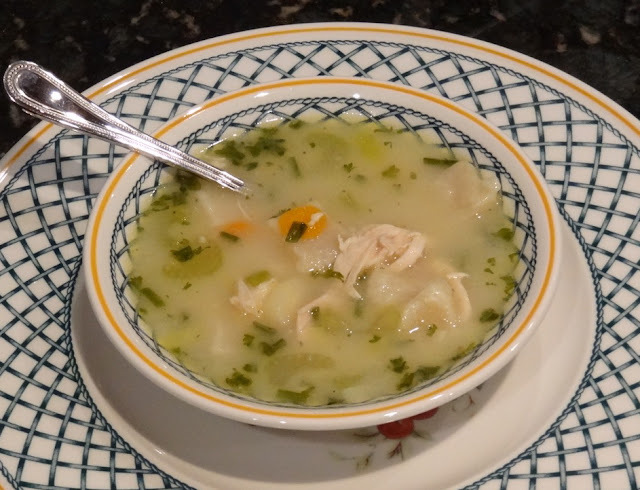 Whatever the reason, you’ve got to try this chicken and dumpling soup that is extremely delicious. My mom discovered the recipe from the latest Bon Appetit magazine, and made it for my dad a few weeks ago. He was pleasantly surprised and ate three bowls of it the first night! One week later, I visited my parent’s house, and low and behold, she made the soup again. This time I got to try it; I concur with my dad, it is awesome. The original recipe calls for gnocchi, but my mom did not have any ricotta cheese on hand (my dad went shopping for her, and since he does not like cheese, he probably “forgot” to buy ricotta on the grocery list – haha). Dumplings make a great substitute for gnocchi, and are what we used in this soup. As far as taste goes, I would liken this recipe to a creamier chicken noodle soup. The broth has a savory flavor from the chicken thighs and cooked vegetables. The chives and parsley are a nice addition, and the Parmesan adds a unique twist you wouldn’t expect to pair with soup. I also discovered what a parsnip is… I’m not sure how to describe the taste, but it looks like a white carrot! 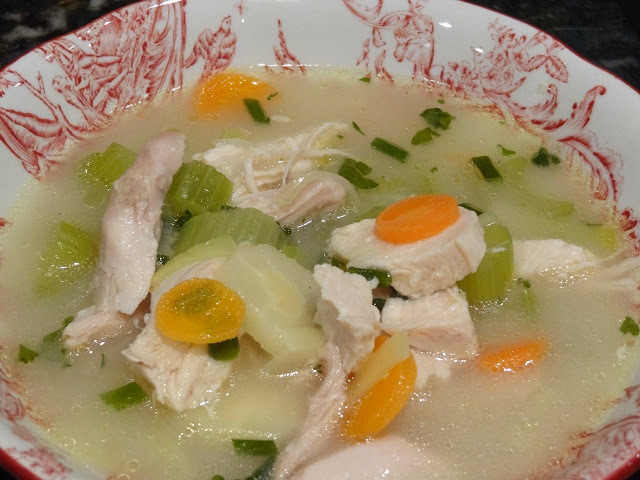 The recipe below looks long and extensive, but don’t let that scare you into making chicken and dumpling soup. The instructions are detailed, and the recipe surprisingly easy. Enjoy! 1. Mix the flour and salt. Cut the shortening into the flour until it is the size of peas. Add the water and blend. 2. On a floured board, roll out to 1/4 inch thick. Cut into 1/2 to 3/4-inch squares. Let dry for about 15 minutes. 1. Bring broth to a boil in a large saucepan. Add chicken; reduce heat to low, cover, and gently simmer until chicken is tender and cooked through, 20-30 minutes. Remove chicken; let cool slightly and shred into bite-sized pieces. Bring to broth to a boil and cook until reduced to 8 cups, about 15 minutes. 2. Meanwhile, melt buter in a small heavy saucepan over low heat. Whisk in flour until smooth and cook, whisking constantly, until roux is pale beige in color, about 15 minutes (do not brown). 3. Scape roux into simmering broth; whisk until thickened and broth coats the back of a spoon. Reduce heat to low and add vegetables. Cook until tender, about 5 minutes. Add shredded chicken and herbs. Season with salt and pepper. DO AHEAD: Can be made 2 days ahead. Chill, uncovered, until cold; cover and keep chilled. Rewarm before serving. 4. Drop dumplings into boiling soup. Cover tightly (don’t lift cover); reduce heat and simmer for 12-15 minutes, or until done. Using a slotted spoon, transfer dumplings to bowl, dividing equally. Ladle chicken and vegetables with gravy over. Season with peppers and top with Parmesan. 1. If using fresh ricotta that has excess liquid, you may need to drain it overnight. Line a fine-mesh strainer with cheesecloth and set it over a medium bowl. Add ricotta; cover with plastic wrap and let drain overnight in refrigerator. If using supermarket ricotta, proceed with recipe; no draining required. 2. Gently mix ricotta, 1/2 cup plus 2 tablespoons flour, egg, Parmesan, nutmeg, and salt in a large bowl just to blend (do not overwork). Form dough into a ball (it will be sticky); wrap in plastic and chill for at least 1 hour and up to 1 day. 3. Line a baking sheet with parchment paper; set aside. Place dough on a lightly floured work surface. Divide dough into 4 equal portions and cover with a clean kitchen towel. Using your hands, roll 1 portion into a 1/2″-diameter rope; cut crosswise into 1/2″-thick pieces. Lightly dust gnocchi with flour and transfer to prepared baking sheet. Repeat with remaining portions of dough. Cover gnocchi with a kitchen towel and chill until ready to cook. DO AHEAD: Can be made 2 months ahead. Freeze on sheets, then store, frozen in an airtight container. 4. Cook gnocchi in a large pot of boiling salted water, stirring occassionally, until gnocchi float to the surface, about two minutes (slightly longer if frozen).